Attention – artists crave attention. Even the most introverted artist wants his or her work to be recognised, to attract viewers, to stimulate discussion, ideas, debate. Let’s start in Venice a city with magnetic appeal to artists. Last year Venice hosted the Biennale, a modern art event that fills the city, every two years.Even before the Biennale started on 13th May, Venice was already abuzz with the Damien Hirst Exhibition ‘Treasures from the wreck of the Unexpected’ which opened at the Palazzo Grassi and Punta della Dogana in April, 2017. Hirst’s sprawling spectacular show consists of numerous large sculptures, often barnacle encrusted, that had allegedly been salvaged from a ship wreck in the Indian Ocean. 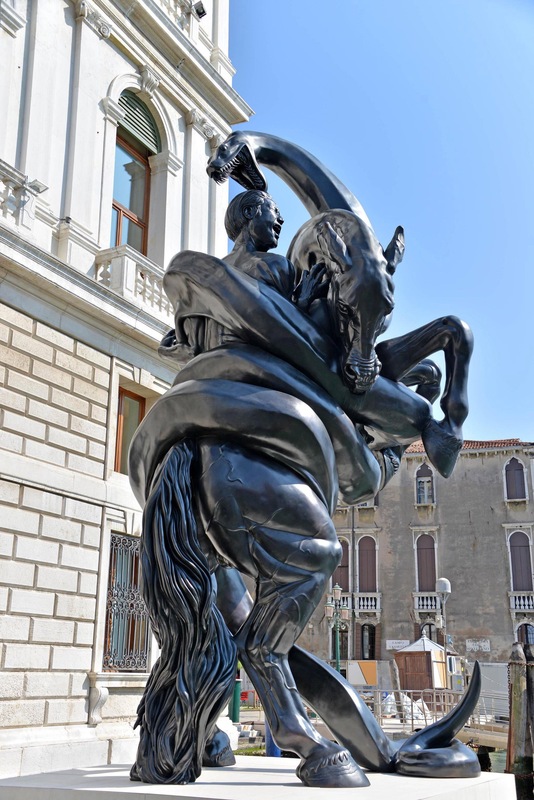 In pride of place on a floating platform outside the Palazzo Grassi was one of the most impressive exhibits, a huge metallic image of a horseman and his stead, entwined in the coils of a deadly sea monster. The fate of the horseman was clear to see, from the contorted and terrified facial expression. I immediately thought of the Laocoon a mythical multi-headed serpent that appears in Greek and Roman sculpture. I was highly impressed by the creative and imaginative nature of Hirst’s extensive exhibition and made a mental note to return to Venice for a proper look around both the ‘Treasures from the wreck of the Unexpected’ and the Biennale exhibits. 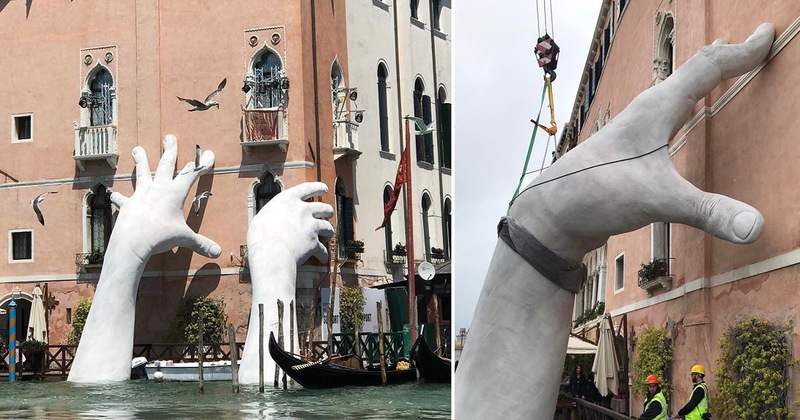 Then on TV a few weeks later I saw Lorenzo Quinn’s monstrous white hands being transported slowly and carefully up the Grand Canal and under the Rialto Bridge. Amazingly, Lorenzo Quinn’s incredible ‘Le Mani’ sculpture had immediately upstaged Damien Hirst’s multi-million euro exhibition. ‘Le Mani’ were installed on the front facade of Ca’Sagredo. A charming, salmon-pink palace which is one of the most distinctive and typically Venetian palaces on the Grand Canal. It stands next door to the white marble palace of Ca’ d’Oro and opposite the Venetian fish market. The positioning of the sculpture was brilliant. 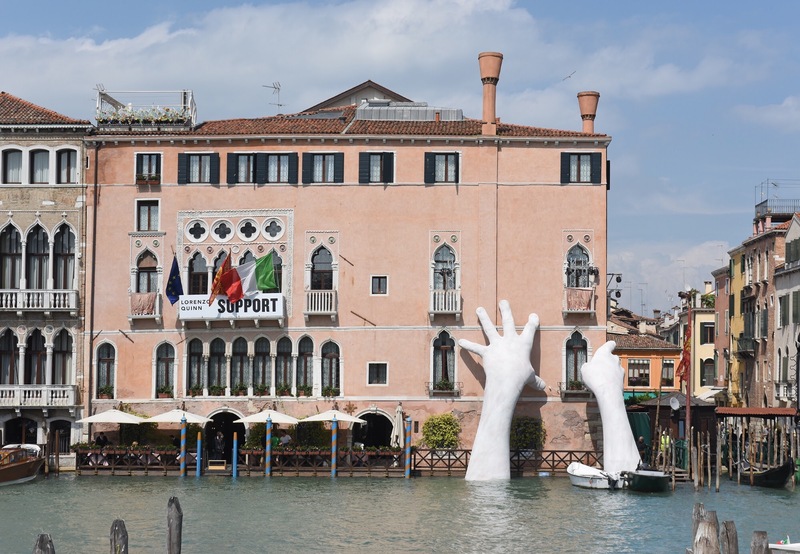 Every visitor travelling along the Grand Canal saw Lorenzo Quinn’s impressive and thought provoking hands. His installation is called ‘Support’. In a recent interview on Italian TV Quinn explained that his intention was to encourage support and protection of our beautiful environment, in the face of threat from climate change. He acknowledged that Venice is a unique and beautiful city, that must be honoured and respected to maintain its delicate relationship with the waters of the lagoon. The white hands with fingers slightly curved push against the stone of the palace. 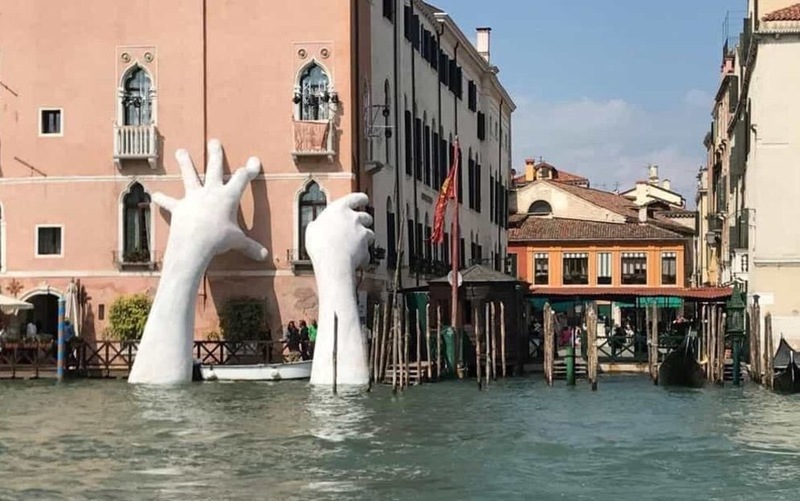 These hands are supporting the palace and symbolically supporting the city of Venice against the rising waters of the Adriatic Sea. Perfect timing for a magnificently executed art work. The idea of a sculpture at Ca’Sagredo came from the enigmatic director of the hotel Lorenza Lain. Herself a native Venetian, she is passionate about Venetian heritage and culture, Lorenza suggested to Lorenzo Quinn that he prepare something for the Biennale to be displayed at the hotel just about two years ago. 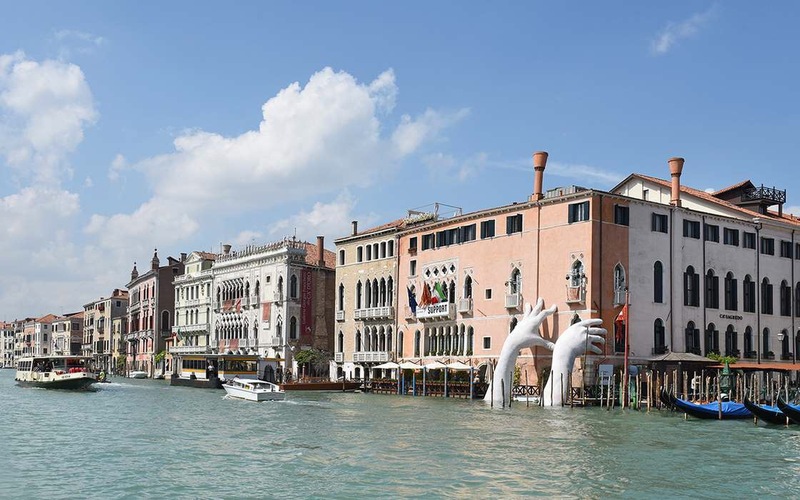 Lorenzo Quinn was having dinner at Ca’Sagredo at the time and immediately began to think about Venice and a piece of work that would fit the city. Venice has a truly unique relationship between land and sea. Lorenzo used this interesting juxtaposition between land and sea to create a powerful and disturbing sculpture. A piece of work that demands the attention of the passer-by. The position of these death-like white hands against the warmth of the stones of Ca’Sagredo creates a powerful contrast. The hands are helping, assisting, supporting the mellow stones of this historic palace. The hands encourage the stones to keep on being solid and firm providing a foundation for all that is yet to come. Even better the hands are visible to all, every person making their way along the Grand Canal can see the hands just on the left before you reach the Rialto Bridge, if you are heading towards San Marco. The exhibit is part of the waters of the Grand Canal and free to be viewed by all. A very democratic approach to art. The result of Lorenzo’s creativity is for all to see. I was fascinated by his name and immediately assumed he was half Irish and half Italian. In fact Lorenzo Quinn’s heritage is quite complicated. He is the youngest son of the Hollywood actor Anthony Quinn, who himself was Mexican-Irish. Lorenzo is actually Italian and Mexican with some Irish blood, a feisty concoction indeed. Lorenzo did some acting and starred in a film about the life of Stradivarius, the Italian violin maker, with his father playing the character as an old man and Lorenzo playing the character in his youth. Anthony Quinn of course was a Hollywood Great starring in Zorba the Greek, The Guns of Navarone, Lawrence of Arabia. Although the role that really endeared him to Italian audiences was his role in La Strada for Federico Fellini. A talented lineage indeed! The attention that Damien Hirst and Lorenzo Quinn are receiving in Venice is great for the city. It confirms Venice’s status as a significant centre of modern and contemporary art. It also confirms the depth and importance of Venice in our cultural heritage. If Venice is mentioned in a conversation images spring into our minds, gondolas, St Mark’s Basilica, George Clooney’s wedding…All symbols of Venice and her enduring vitality, style and elegance. Venice remains today a focus of art, style and architecture. We must cherish this legend, our heritage, as a reminder of the beauty and wonder that humans can create when we all pull in the same direction. The barge carrying Quinn’s sculpture moves up the Grand Canal. THE FINAL CHAPTER: Let’s hope not – spero di no! The sculpture is moved back across the lagoon to Porto Marghera. It will be shipped to Barcelona – to Lorenzo Quinn’s studio for repairs. It’s future location is yet to be decided. Wow! This is very cool, and I can’t even imagine what it took to be installed! Thank you for showing us other hand projects he has done. I am so taken with his work! Glad you liked it! I must admit I’m very impressed with the imagination and the idea of the sculpture. So appropriate for our times.